With QuiltCon East being held in Savannah, Georgia, in less than a month, I am excited to say that I will be there! I will be working behind the scenes as part of the “crew” that helps put on the show, so I will be very busy for over a week. If you are planning to attend, I hope we get a moment to connect and say “hi!”. I have been fortunate to be able to attend every QuiltCon that has been held so far, and I am thrilled to be working alongside Modern Quilt Guild staff and other amazing volunteers this year to help make the convention the best we can. Prior to attending QuiltCon in Austin, Texas, in 2013, I had attended a few other quilt shows. When I lived in Hampton, VA, I would attend the Mid Atlantic Quilt Festival held in Hampton. But it wasn’t until I saw the class list for QuiltCon that taking a quilting class really spoke to me. I was ecstatic to take a free motion quilting on your domestic machine class from Elizabeth Hartman in 2013 and I know that it changed my creative arc as a quilter as a result. So all of this recollection and rumination has me thinking about what my “Dream Quilt Convention” would look like. Honestly, for me, it would look a lot like QuiltCon, but mixed with a heavy dose of quilt retreat: several large rooms for open sewing (which actually is a new addition on the QuiltCon schedule this year, by the way!). I counted 140 different workshops on the schedule for 2017! With that many choices, there is likely a workshop (or 5) that speak to you. The workshops for QuiltCon do tend to sell out quickly when registration opens the June prior to the event. What I like about the workshop options at QuiltCon is that there are 3 hour workshops, 6 hour workshops, and the mega 9 hour workshops to consider. Pricing clearly is based on the length of the workshop, and it is possible to fill up your schedule entirely with classes if you so desire! Which brings me to maybe my favorite workshop that has been offered first thing every morning every year at QuiltCon: Yoga for quilters! I have found that taking it each morning is a great way to be gentle with myself and prepare for a day of standing, walking, and interacting with so many wonderful people. There are 22 Lectures are on the schedule for 2017. Each time I have attended QuiltCon, my mixture of workshop and lectures has changed. I have noticed that over time I have become more interested in the lectures and carefully selected down to one workshop to attend in order to keep more of my time “free” to spend walking the quilt show, visiting with friends, and making plans to have lunch or network with others. Each lecture is 45 minutes long and the lecture series includes the awards ceremony (last year I had such an honor of being there to support my friend Renee when she won the Best Quilting on a Domestic Machine!) and keynote speaker (Angela Walters for 2017). With so many workshops and lectures, the faculty list is very impressive; the leading modern quilters are definitely on hand at QuiltCon. I have also found that as long as an individual does not have a prior appointment, most people at QuiltCon (faculty and attendees and MQG staff and crew and volunteers alike) are approachable, friendly, and open to having a conversation. The great thing is that we all clearly have something in common: a love for quilting! One thing that I have touched on obliquely up to this point is that QuiltCon is a modern quilt convention. Beyond having the leading modern quilters on their faculty and being run by The Modern Quilt Guild, the quilt show is an impressive way to showcase hundreds of modern quilts. As an active participant in the online community, I am always excited to see the work of online friends in person. What is even *more* exciting is to find beautiful work that is completely new to me, and I savor the time I get to spend at the QuiltCon quilt show. QuiltCon has grown quickly and been adapting itself quickly as well. Based on feedback from earlier shows, the 2016 QuiltCon show in Pasadena, CA, included social media information on the quilt descriptions if provided on the entry form. I will acknowledge that I don’t just view myself or my work as strictly modern, and I certainly have quilting friends whose work ranges all over the quilting spectrum from Traditional to Art to Modern. Getting work juried into a quilt show is also no sure thing and there could be many more beautiful exhibits curated from quilts submitted but not selected to show each year at QuiltCon. This is a new addition to the QuiltCon schedule this year, and I am really interested in how it works out. One room is being set aside each day for “Open Sew”. I am a bit unclear if you need to have signed up (and paid?) beforehand to get access to the room. The Open Sew concept is something that I have really wished for in past years, and working as crew this year I will have to rely on those attending to give feedback on how it works! 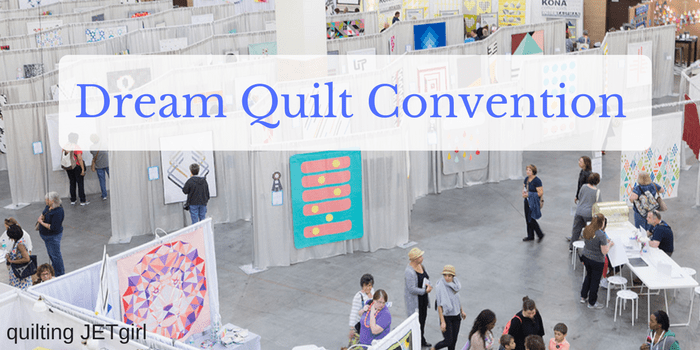 Quilt vendors are part of the element of a convention, and one of the reasons that QuiltCon resonates with me is that most (if not all) of the vendors that excite me participate and even help sponsor the event. It was thrilling to get to talk with Alex from Aurifil last year, and I look forward to getting to meet business connections face to face at QuiltCon each year. It’s a lovely chance to connect (and network as I mentioned earlier) with the people that I interact with online throughout the year. QuiltCon runs 4 days, Thursday through Sunday and I have to admit that in the past I have run out of steam by mid-day Saturday. With so much going on, the stimulation does add up for me and in the past I have taken Sunday as a travel or recuperation day. This year will be different, and I look forward to coming back and sharing how my experience changes this year working as part of the crew. Which really comes down to probably the best draw of any convention: the attendees. I have so many online friends that I get a chance to connect with at QuiltCon and that is what makes it extra special for me. Even if there is only a moment for a hug and a quick hello, it is so wonderful to have many of my online friends, acquaintances, and blogging buddies in the same location. I’m grinning ear to ear now just thinking about it! QuiltCon: A Dream Quilt Convention? To be honest, a convention as large as QuiltCon lacks the intimacy that can be found at smaller quilting retreats, like the Quilt Bliss retreat I attended a little over a year ago, so I can also see the benefit in a much smaller version of this where one or two instructors offer classes offset by open sew activities in a more intimate single hotel or BnB type retreat environment. Speaking of Quilt Bliss – I registered for the retreat through Eventbrite. If you are looking for quilting conventions near you, or want to put your own Dream Quilt Retreat, you might want to check out what Eventbrite has to offer. The scale and offerings available at a large convention like QuiltCon do offset the lack of intimacy by offering smaller interaction opportunities through workshops. I also know of many friends who are rooming together to make the convention more “retreat” like in the off hours. But if I am to come up with a “Dream Quilt Convention“, I can’t think of much that is missing from QuiltCon. I fully acknowledge that QuiltCon is very modern and is not to everyone’s tastes. What would your Dream Quilt Convention look like, or what could be added to QuiltCon to make it even better? This was a great post with lots of encouragement for anyone not familiar with QuiltCon or with the benefits of attending a large quilt show. I missed the one in Pasadena last Feb. but can’t wait for 2018 as I really want to attend. I think mentioning volinteering is important, too, as quilters don’t undestand the amount of work involved in putting together a show even when it’s time to put up and then later take down the show. That doesn’t consider all the work done before and during. If you can continue to mention or show what has to be done it will be a great service to all quilt guilds which have to beg for volunteers. Thanks! I don’t think I congratulated you on your accepted entries so congratulations! I am attending QuiltCon for the first time this year in Savannah. So looking forward to the inspiration! I appreciate your article today–lots of good information. I will be attending and this is my first quilt convention ever. I will also be a volunteer so this promises to be quite an adventure for me! My “must see” exhibit will be your quilt entries. I can only imagine how excited you must be! Here’s hoping that our paths will cross! Your summary of what to expect is fantastic. Thank you for taking the time to put it together. Yvonne, this is a fantastic post! I agree, I think it’s wonderful but totally overwhelming. I’m one of those ambiverts – I’m a super stoked extrovert for about 2 days, and then I lose steam and just want to relax by myself or with 1 or 2 people. Lol. A good way to be introverted at QuiltCon is to get lost in the quilt show itself. I hardly ever get to travel so I decided not to volunteer this year and take more time for sightseeing. I really want to travel around Savannah; I feel like I did not get to see much of Austin 2 years ago. Are you taking yoga? I’ll be there Friday and Saturday!! 🙂 Plus, we are definitely going to have a meal at some point, okay? Your post got me all excited that QuiltCon is right around the corner. The thing I love the most about this convention is being around so many creative, like minded folks, which is very stimulating! My favorites are the quilt show, the lectures and connecting with people. My least favorite are the travel logistics and I will be traveling by myself. But, I know I will spot other quilters in airports and on planes who have their handwork in evidence. I’m participating in my first mini swap, so I am working hard on the hand quilting now. My mini has been on two trips already, and some of the quilting was done on planes to and from the Road to CA. I’ll be sure to say “hello” when I see you out and about in your “Crew” t-shirt! I attended Austin, passed on Pasadena, but have my reservations for Savanah…I am signed on as a super volunteer again – did that before and loved the opportunity to learn some of the behind the scenes work. Happy Chinese new year. I am glad that you have such positive experiences. And congrats on serving as part of the crew-it should be a new and interesting experience that way. It’s a great post Yvonne and I’m looking forward to my quick hello and hug so I hope we find each other some how! Great post, even for those of us who won’t make it. I hope you have a fantastic time. Great post! QuiltCon is my favorite quilting event to attend. My favorite part of the event is meeting with all of my friends who I only get to “see” online. I am also excited that it is in Savannah this year so I can just drive. Oh it sounds wonderful Yvonne …… I am hoping to be able to go next year! This will my my first year missing QuiltCon. I’m so bummed, but my little man (4 months old) still depends on me too much for me to be away from him. This is a fantastic write-up of the event! I had a great time at QuiltCon last year but won’t be going this year. I definitely learned not to schedule so many workshops. It sounds like volunteering adds a really valuable dimension to an already awesome experience. I really like the idea of there being an open sew room. It was so good to meet you in person last year and I sure hope to see you again at a future QuiltCon. Take care, Mary.